Fruit farmers in Okayama, Japan, have managed to make peeling a banana optional by developing a special variety with edible skin. The peel of their “Mongee Banana” is not particularly tasty, but it is considerably thinner and far less bitter than that of regular bananas, making it 100% edible. To create the incredible Mongee – which is actually Okayama slang for ‘incredible – scientists at D&T Farm, in Okayama Prefecture, developed an innovative method called “Freeze Thaw Awakening” which involves recreating conditions from 20,000 years ago, at the end of the ice age, when plants would emerge from harsh winter temperatures to grow. They froze banana saplings to -60 degrees Celsius, planting them again as they began to thaw. This apparently activated an ancient part of their DNA, which not only allows the plant to thrive in Japan’s cool climate, but also accelerates its development. While tropical varieties of banana require two years to grow large enough for consumption, the Mongee banana needs just four months. The first batch of Mongee bananas hit department store shelves in November of last year, but getting your hand on one of these incredible fruits remains a huge challenge. D&T Farms only produces 10 bananas per week, and they only deliver them to the Fruit Corner of Tenmanya Okayama, a local department store. But even if you happen to find one available, you’d probably be a bit put off by the price – 648 yen ($5.70) per fruit. 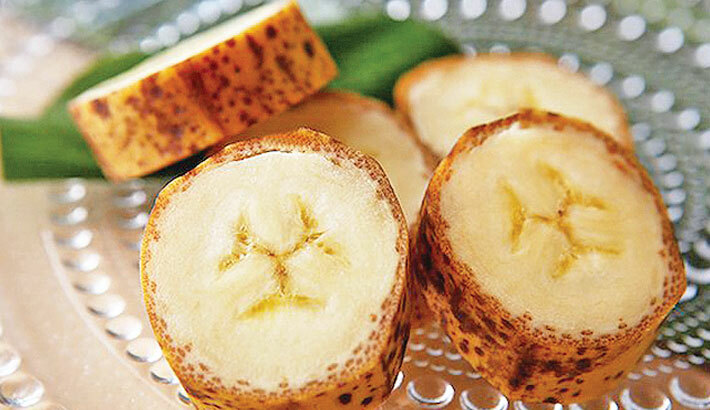 Japanese site SoraNews24 was lucky enough to receive a few Mongee bananas for review purposes, and its staff reports that the fruit is indeed special. First of all, a Mongee is considerably sweeter than a regular banana, thanks to its high sugar content, 24.8 grams, compared to the average 18.3 grams. They apparently have a stronger smell as well, and a distinctly tropical, almost “pineapple-like” taste. One thing that has to be noted about Mongee bananas is that they have to be perfectly ripe in order to be edible, unlike regular Cavendish bananas, which can be consumed long before brown spots start to appear on their skin. But what about that edible peel, right? Well, according to SoraNews24, the skin of Mongee bananas is a lot thinner that that of regular bananas, which makes it much easier to chew. It’s bitterer than the flesh, so consuming it by itself is not a pleasurable experience, but eating it with the very sweet flesh, the skin apparently tastes ok and has a lot of health benefits. D&T Farm claims that the skin of their banana is “an excellent ingredient that can contain vitamin B6 and magnesium related to the synthesis of serotonin” as well as a substance called “tryptophan”, a raw material of serotonin. And, because they are grown in Japan’s cooler climate, Mongee bananas have no natural predators, so they don’t have to be sprayed with any pesticides. The day we all stop peeling bananas and instead bite straight through their skin may still be a long way away, but it’s nice to know that 100% edible bananas already exist.